Whether you know it as Industry 4.0, the 4th Industrial Revolution, or Smart Industry, Manufacturing is going through a deep transformation, with changes that are centered around digitalization. While most industries are already on this digitalization path, the disruption is more visible and pronounced in manufacturing because it is expanding virtual data and processes into environments that have been fundamentally about physical products. This transformation has already started, and its impact is expected to be massive. Technical, economic, and social changes are expected across the whole manufacturing ecosystem, with jobs shifting from offshoring back to nearshoring. Strong technology elements driving this digital revolution include 3D printing, robotizing and automation, smart factory with IoT and machine learning, and supply chain digitization. Their impact is profound. 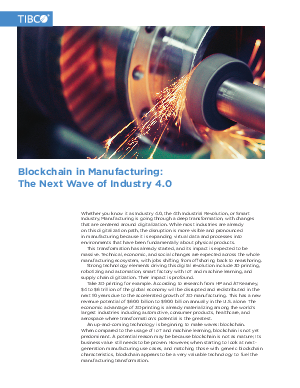 This paper describes key characteristics of blockchain and its various manufacturing use cases.